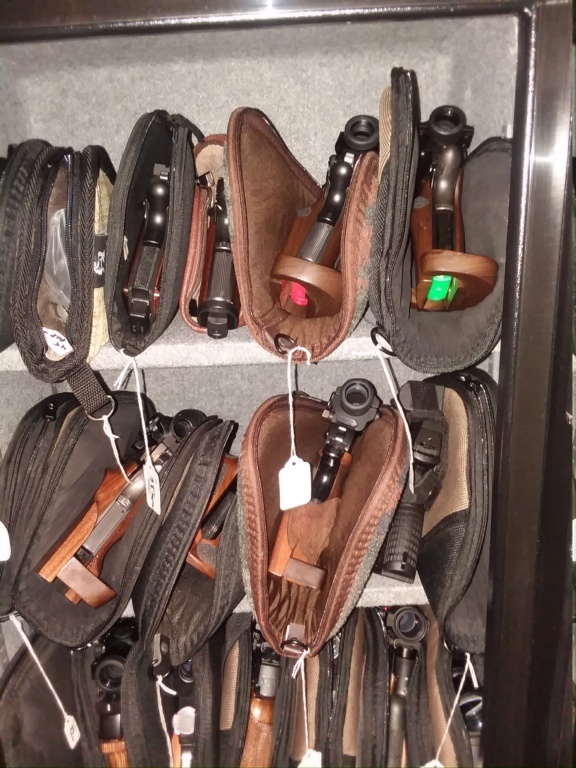 Does anyone care to share any ideas of how they store their pistols and accessories in their safe ? I finally purchased a nice size safe and would like some well proven ideas for scoped guns of all shapes and sizes. I'm an engineer in a large cabinet shop. I made a nice copy of these racks, mine holds 8 pistols I think. These work tho if your handy you can easily make them. I just found these, it looks interesting. I just cant see placing a rod in our barrels. I have 4 of the 6 gun version of the Hyskore rack. Rugs work good. I tag mine so I can zip them all and know what's in them. It is the grips that make most of the store bought not work for me. It is also why they don't fit well in most BE pistol boxes. LenV wrote: It is the grips that make most of the store bought not work for me. It is also why they don't fit well in most BE pistol boxes. This is part of the reason I am asking this question. The Hyskore rack in the video I shared above is adjustable. You can make them narrow, just the right size for a 1911, or make them wide enough to fit a Rink or other target grip. I use the factory box for some things, but once it has an ergo grip or scope, I buy a bigger aftermarket box with foam. I have about six of this one listed below. I have masking tape labels on the box so I know what is in it. It will fit most any scoped and gripped BE pistol with room for a few extra parts. I use this one for unscoped pistols. Perfect for 1911 and will work with ergo grips.